Blazing HOT But We Did Pretty Well…..
Monday…..May 30,2011……What a nice morning…..turned out to be a sweltering day so far too. Temps in the high 80s and the water temps are up too. Water was 56F when we started and 68F when we quit fishing. That is awfully high for this time of the year, hate to see what August brings. Morning fishing was pretty decent guided Dr Don Lucky and we caught 8 fish on our half day trip. It was tough and the fish seemed to shut down with the afternoon heat. Great Week and Hopefully a Good One Coming Up…..
Sunday…..May 29, 2011…….Hope your weekend has been a great one. Things are finally heating up, and with the weather turning hot it will be terrestrial time ……and the ants are out in full force already. Had a great 5 day trip on the South Holston rainwater with Joe Craig’s group, an annual trip that has become on of our favorites. 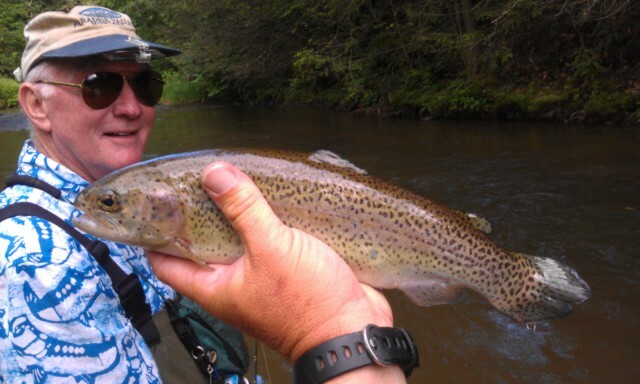 We had a great trip, caught a lot of fish, and some nice fish up to 20 inches……and all on dry flies. Finished up the week with a spring creek trip and some brookies and rainbows…….and then a day trip with Ken Doss and Dell Sikes on some NC waters. We caught a ton of fish Nymphing as the water was still high and murky from recent rains and thunderstorms. We caught probably 40 fish or more and therefore a good day…..it was great. Another busy week coming up, have a guided trip on Monday with Dr Don Lucey, a Tuesday trip with Bill Leinster, a PM lesson with Brian Turpin on Wednesday, a Thursday private water trip with Brian Donley and Jim Fealy, and. Saturday trip with Chad Horelica and Dr. Chuck London. Should have a great week of reports and info. 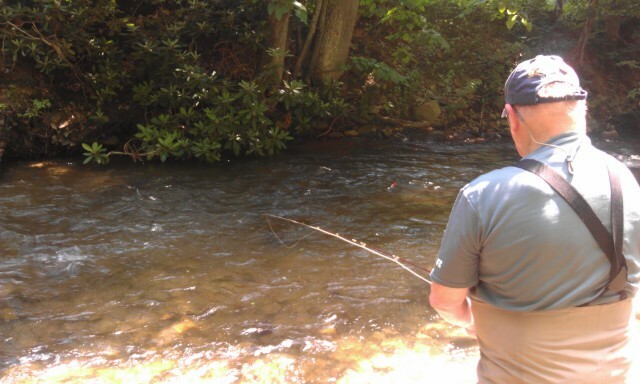 With stream levels in good shape and some hot and dry weather coming up it should be some great fishing time. Have lots of yellow dries in the box and some terrestrial too as the bugs are mostly that with a smattering of blue winged olives and Lt. Cahill (small streams) around. I would also say we are coming into prime time for dry/droppers time on small streams as well. 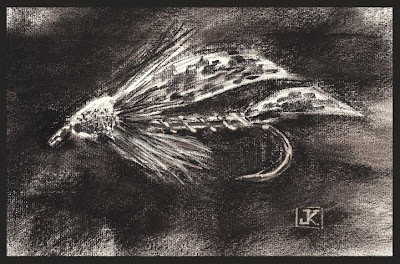 This time of year and through the summer my favorite rig is a sulphur dry and a zebra midge dropper 15-18" below the dry (rainwaters) and an Elk winged caddis dry and a small #18-20 copper john (red is a summer killer…..go figure) as a dropper. Hope the rest of your Sunday is good and also that you have a great upcoming week. Remember all our servicemen and thank one if you can. 40 fish and was an excellent nymph bite. We caught fish on a variety of double rigs. Took Saturday off to spend with the family and to celebrate my wife’s birthday. Hope your weekend’s grand! 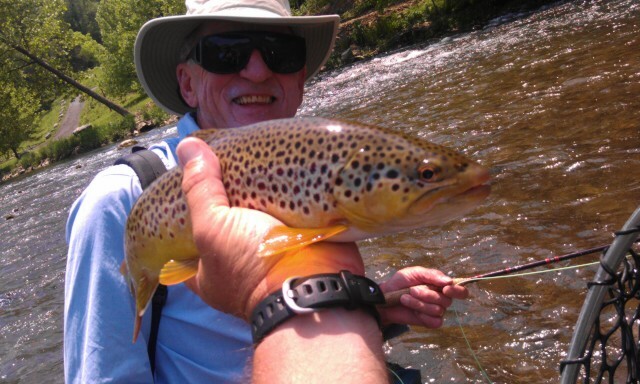 Friday…May 27, 2011….in the NC Mtns today guiding Ken Doss and Dell Sikes from Atlanta, VA. We are fishing today in high and murky conditions, a big contrast from yesterday’s dry fly fishing on the South Holston….but it should be good and fun and we have a shot at some big guys today. What A Great Finish to A Great Trip…. Thursday….May 26, 2011…….Great finish to a great trip, we got into some blue winged olives and sulphurs and was guiding Joe Craig, Locke Clifford, Bill Leinster, Wendell Ott, and Pat Meisky for a SoHo half day today and we had a 40 fish day all nice browns 13-16, and all on dry flies. 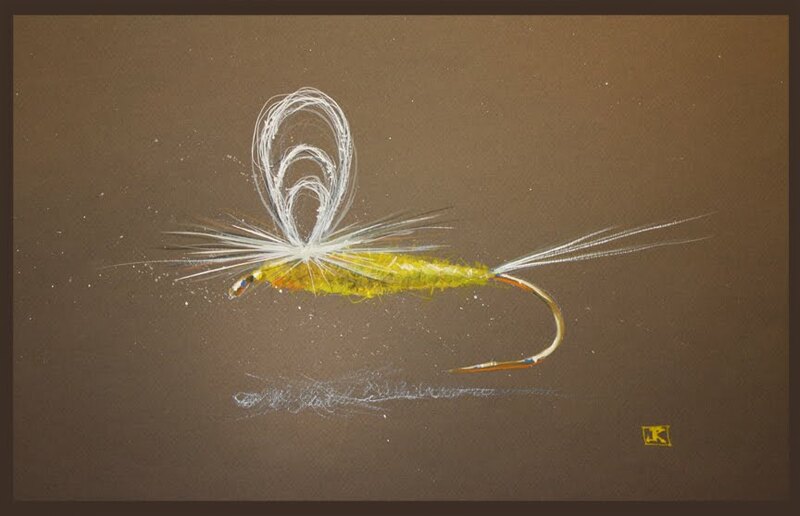 I have been tying some new dun and emerger patterns and they worked well. 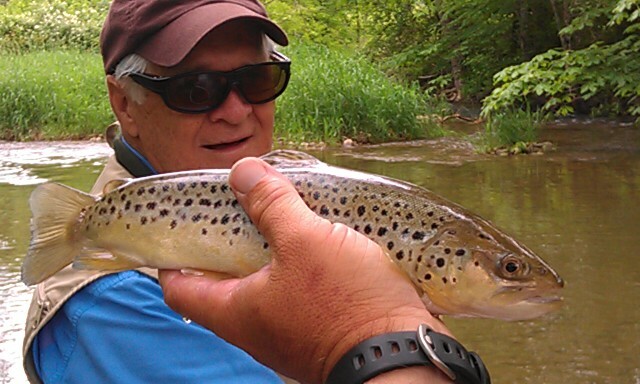 We hooked and lost a 20 inch brown….on one of my new bwo emergers . The water came up on us at 215pm so we called it a day. Am just leaving Possum Creek, TN and headed to do a trip tomorrow in NC mtns with Ken Doss of Greensboro, NC. Should be a good day, hope the weather holds as there’s some bad weather and a front to our West that could spell trouble. Thursday….May 26, 2011…….Great finish to a great trip, we got into some blue winged olives and sulphurs and was guiding Joe Craig, Locke Clifford, Bill Leinster, Wendell Ott, and Pat Meisky for a SoHo half day today and we had a 40 fish day all nice browns 13-16, and all on dry flies. 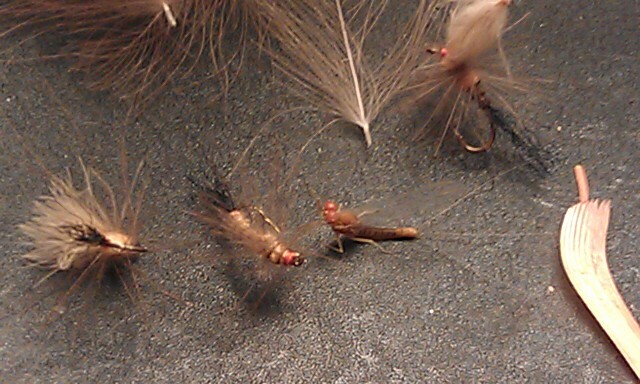 I have been tying some new dun and emerger patterns and they worked well. 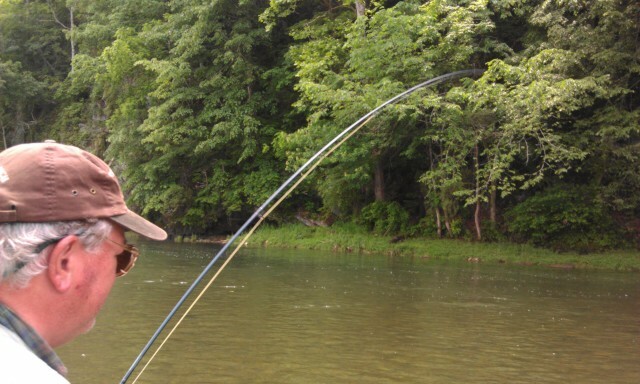 We hooked and lost a 20 inch brown….on one of my new bwo emergers . The water came up on us at 215pm so we called it a day. Am just leaving Possum Creek, TN and headed to do a trip tomorrow in NC mtns with Ken Soda of Greensboro, NC. Should be a good day, hope the weather holds as there’s some bad weather and a front to our West that could spell trouble. 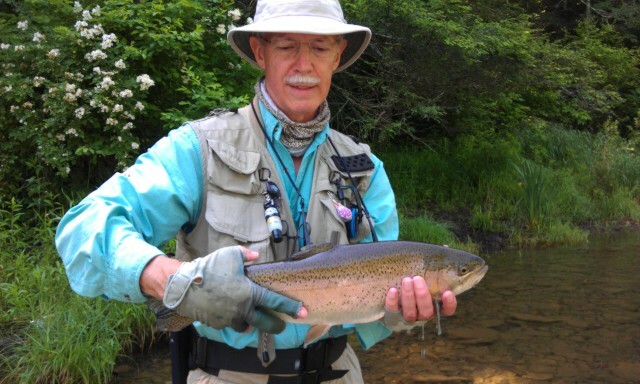 Great Morning in East TN…..
Wed……..May 25, 2011………..What a day and what an unbelievable hatch……where else around here can you fish dry flies to rising trout all day long? That is exactly what we did today. guided Bill Leinster and Locke Clifford this morning and we had some incredible fishing early on blue winged olive spinners. 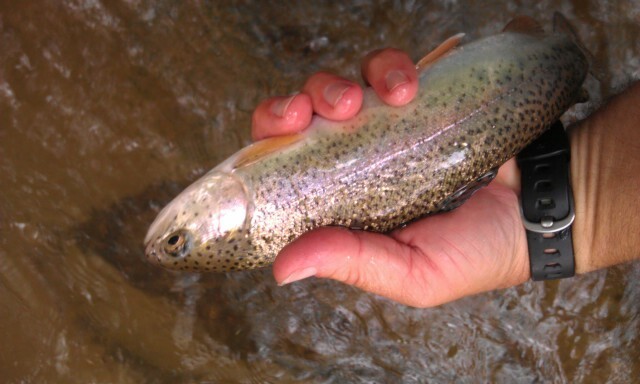 Caught browns and bows up to 17" on size 20 dry flies. Then Guided the others in the group including Wendell Ott, Pat Meisky, and Joe Craig and we fished one of he heaviest sulphur hatches to date. We caught fish on a variety of dry flies, including some new designs from this years experimentation at the river and be vise ……..I have spent weeks this year fishing fly patterns, running up the hill to the house, tweaking a fly here and there, running back down and testing them….often several times day. And there’s no better critic than the population of large free rising brown trout that call this river home. 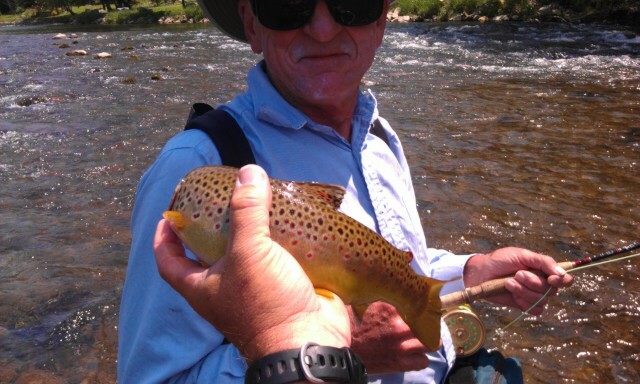 We caught a lot of quality 14-18 inch fish today, all on dry flies, and Joe Craig took honors so far for largest fish at 19 1/2 inches….Wendell Ott landed 4 that were 18" , and all in all it was a quality fish day. Will be tying a box full of flies this evening for the fishing to come. We will see if we get this kind of fishing two days in a row….the key with the sulphurs is a water temp of 52-56F.